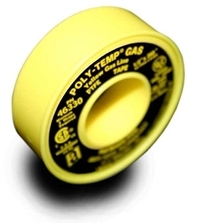 POLY-TEMP® GAS Yellow Gas Line PTFE Tape is our highest grade of PTFE tape, extra thick and extra density material, has approval from the CSA (Canadian Standards Association) for gas lines (CSA #4-90). UL Listed, Recognized Component and ULC Poly-Temp® Thread Seal Tapes are 100% PTFE from the highest quality resins available. This universal thread sealant can be used on all types of metal or plastic pipe connections and effectively seal a vast array of chemicals. Suitable for oxygen systems.